The Honda Motorcycles women love to ride! Let me introduce you to Aj "Suga Soldier" Coffee from Albuquerque, New Mexico. She is sitting atop her 2004 Honda Shadow Aero 750. What a smile! Don't you love that tank! AJ describes what is on her gas tank in a post she sent us called Enjoying the Enchantment, Loving the Legacy... Buffalo Soldiers! back in late December 2010. This page is devoted to all the submissions that you have sent us about the Honda Motorcycles YOU love to ride. We've been asking since 2007 what is the Best Bike and you have spoken. Honda is the second most popular motorcycle, after Harley Davidson, that you have told us that you love to ride. The results are close too! Harley may be the most popular here on our site, but a lot of women love to ride Honda Motorcycles and we have featured them here in their own words. Our collection of articles is not written by professional writers. 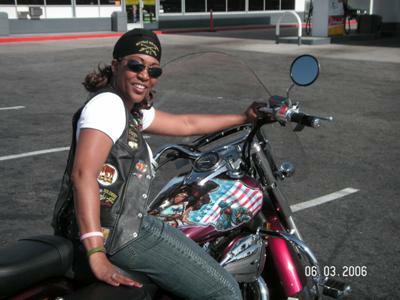 Every article here is has been written by a woman who loves her motorcycle and she has sent in her reasons to us to publish on our site. These are her words and I hope you enjoy reading our collection sent in to us by women who love to ride Honda motorcycles. I found the perfect bike! 2001 Honda Shadow Spirit 750 - "Thelma"
I have a black 2008 rebel 250. Enjoying the Enchantment, Loving the Legacy... Buffalo Soldiers! I'm 46 yo and it's my first bike im 5'1 and it fits me like a gloveI Love this bike. Love my Shadow Aero! It is all black with snake skin flames. I've replaced exhaust with Vance & Hines (love them), and continue to add accessories! My bike is a 2003 Honda Shadow Spirit 750. Her name is in memory of my grandmother who I called Gunga Girl. Honda CMX Rebel 450 bought in June of 2007 ~ put about 4000 miles on ~ perfect bike for me. Got brand new in March 2008. HardKrome DD exhaust. Lots of chrome! I love my bike. It has been so much fun to work on and put together the way I wanted it.